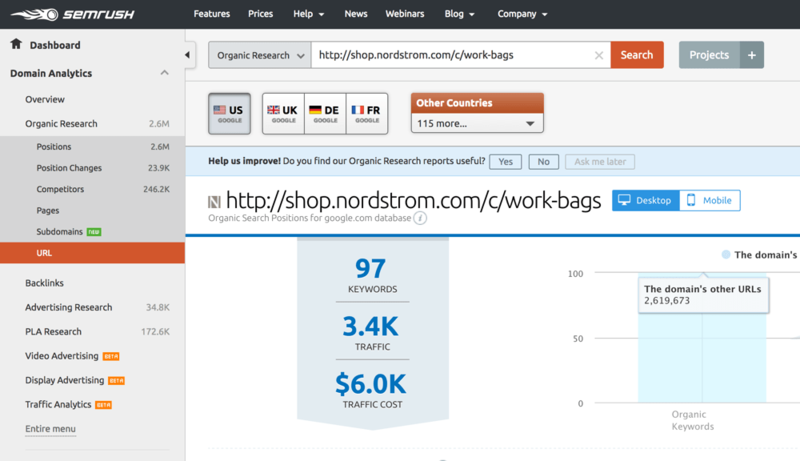 How is keyword research for an ecommerce website different from a blog or other websites? What do you need to take into account when searching for keywords you can target in your product pages, product categories or ecommerce blog? When running an ecommerce website, your primary goal is to make more sales and this is different from the goal you have on a ‘normal’ website, which is to get more traffic. To make more sales, you don’t need any kind of traffic but you need targeted traffic and above all, traffic that converts. While there many ways to increase your website’s traffic and many reasons why this is not happening yet, it all starts with good keyword research. 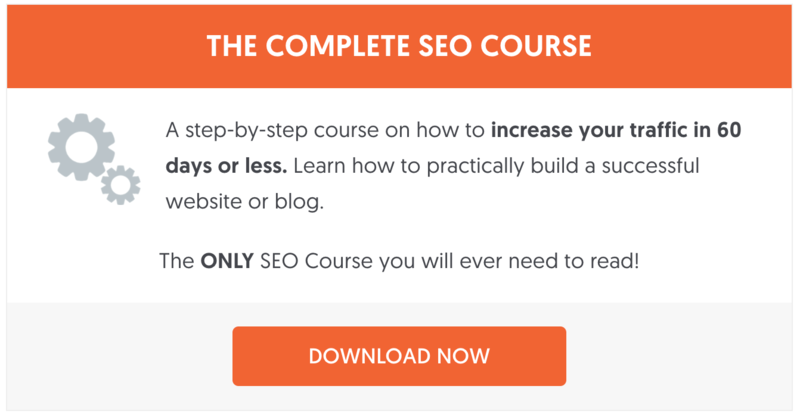 Any time you spend on doing keyword research for your online shop (especially at the beginning), is time that will pay off later in the form of traffic and sales. So, let’s see what exactly is keyword research and why it is very important for the success of an online store. 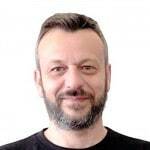 What do we mean by keyword research? Keyword research is a term that describes the process to follow to find out which keywords (search terms), people are using when looking for something on the Internet. This is what they type on the Google Search Box, Bing, Yahoo, Facebook or any other search engine or online medium. Knowing what people are looking for, can help us provide the search engines with the right content and also give our readers content using terms (terminology and context) they can understand. Take Google as an example, their mission is to show high quality websites in their search results, that answer user’s queries. If we want to increase your chances of ranking higher in Google, you need to give the Google bot the right signals when crawling the content of your pages and one of the ways to do this is through keywords (based on the results of keyword research). Higher rankings is equivalent to more traffic. 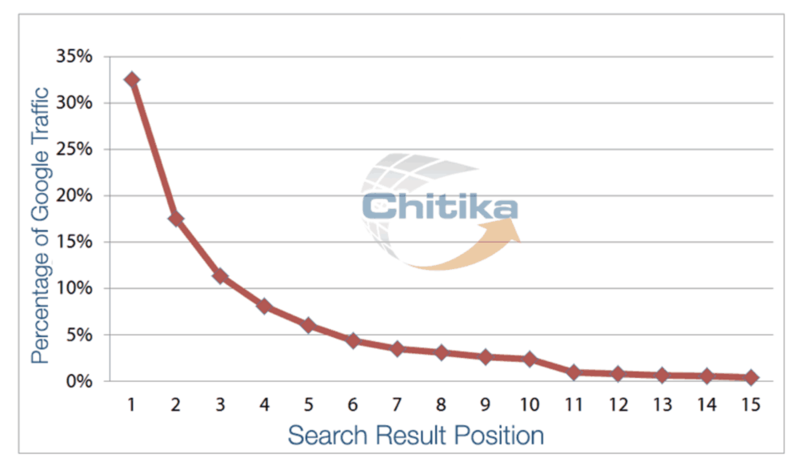 As shown in the graph below, websites that appear at the top of the SERPS get more than 60% of search engine traffic. 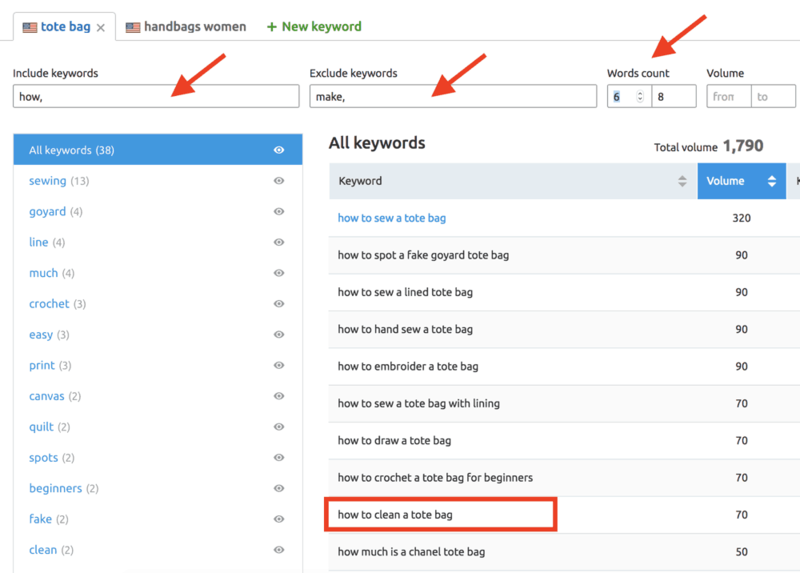 Before getting into the details on how to do keyword research for an ecommerce store, let me give you an example that shows the importance of keyword research. Let’s say that you are selling ‘hair extensions’ in your store and you have product pages for each different type. How you will name your categories and landing pages, depends on the results of the keyword research. Keyword research will tell you what people are searching that is related to ‘hair extensions’ and you will have to adjust your titles and (on-Page SEO) accordingly. If you skip this step and name your categories and products whatever you believe it will work, or the internal names you use for your products, most probably it won’t. Another concept that is important when doing keyword research for an ecommerce website is how to differentiate between general keywords and keywords with a commercial intent. General keywords or head keywords are usually high traffic but don’t necessarily have a specific intent. For example, when a person is searching for ‘handbags’, is most probably at the initial stages of the buying cycle. At this stage the searcher wants to get an overview of what is available without necessarily having a clear intent. Long tail keywords on the other hand are more precise. 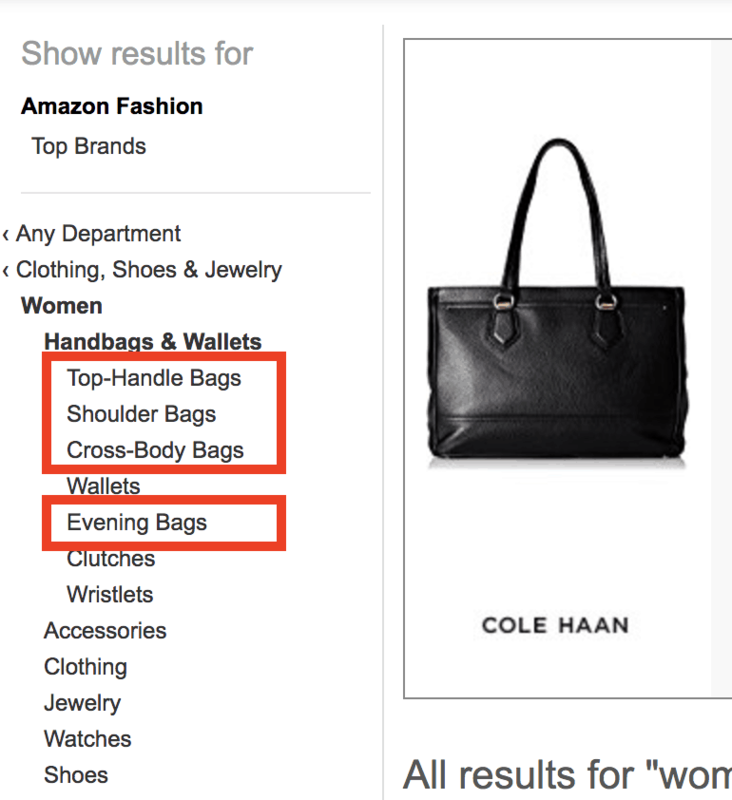 For example, the query ‘handbags for women’, shows that the searcher is looking for women’s handbags but it is still not very ‘commercial’. The queries ‘women’s shoulder handbags for work’ or ‘handbags for work furla’ are very specific and have a clear commercial intent. The reason I’m mentioning this now is the following: When optimizing your product pages, you need to take into account the ‘intent’ of the user and not go after what is more popular in terms of search volume. Remember that your goal is to make more sales, so you need visits from customers who are ready to proceed to the next step i.e. convert and these are the keywords you should be targeting. Let’s see how you can practically find which keywords have a commercial intent and are easier to target. 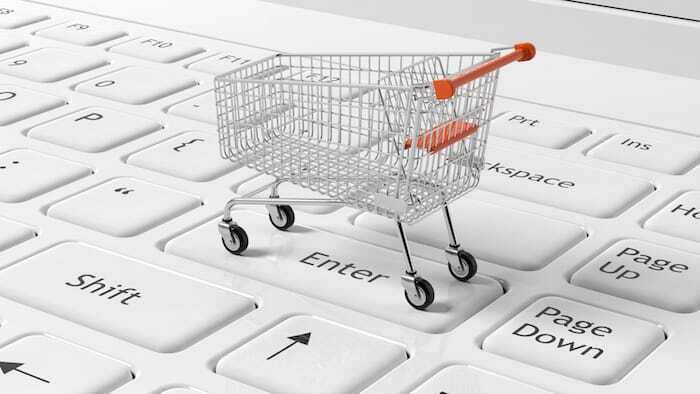 What is the first thing that comes in mind when talking about ecommerce? Most probably it’s Amazon. Amazon is the biggest ecommerce store online and many studies have shown that people looking to buy something, start their search with Amazon (and not Google or any other search engine or platform). So, if this is what people are doing, you should follow their path and start your keyword research with Amazon. Go to Amazon and start typing a keyword that describes your products. Amazon suggest will immediately give you an overview of what people are searching related to your keyword. At a glance, you can see the most popular categories (bags for work, bags for school) and the most popular brands (Michael kors, louis Vuitton). To take it a step further, select a category to view the results and look into the left sidebar. What you will find is the top categories related to ‘handbags’. If your store is selling ‘women’s handbags’ then these are the best candidates for your product category pages. The above is very useful for your product category pages and website structure but what about the actual product pages? While on amazon, go to the best seller’s page – https://www.amazon.com/bestsellers and navigate to the appropriate department. Browse through the best selling list and find products that are similar (or the same), as the ones you are selling. Take note of the keywords used in the title and description i.e.‘casual double zipper’, because we can use this later to find long tail keywords related to the particular product. Pro Hint: While on the product page, take a note of the Customers also bought section. This will give you a very good idea on how to setup cross selling on your store. Now that you have a better idea on what people are searching on Amazon, it’s time to look into Google and the best way to start your keyword research is by visiting Google.com. As soon as you start typing, Google will make suggestions on how to finish your search query. At this stage, try to keep you search limited to 2-3 keywords, for example: ‘womens handbags work’. Scroll down (at the bottom of the page), and look at the ‘related searches section’. What do you notice in the above screenshot? The term ‘tote bags for work’ is a term related to ‘women’s handbags work’. This is a great new keyword which we will analyze using our keyword tools to find out more details. I also strongly suggest to take this keyword and go back to Amazon and repeat your search. You can repeat this process for searching Google and taking a close look to the ‘Related Searches’ many times until you have a list of all related keywords. Now that we have gathered enough keywords from Amazon and Google is time to utilize the power of a keyword tool. 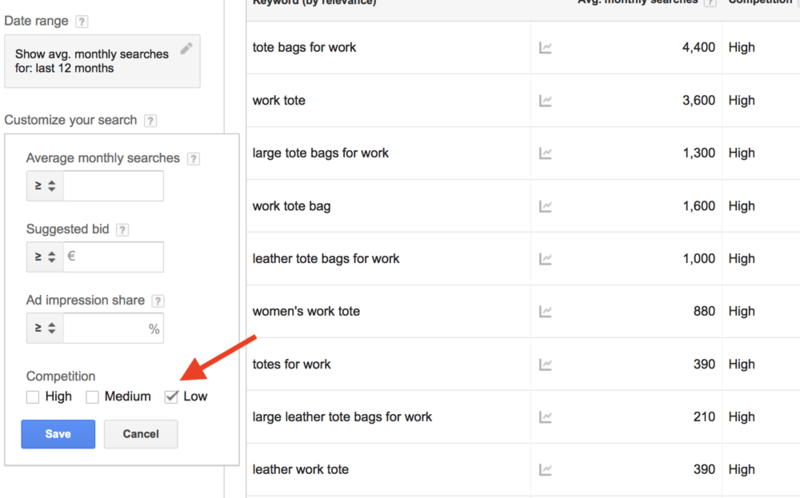 A good keyword tool will give us a better insight on the search volume for each keyword and help us decide how to optimize our product pages. There are many tools available but I personally like to use SEMRush. Even if you don’t have a semrush subscription, you can follow the steps below and get similar results using your favorite keyword research tool. 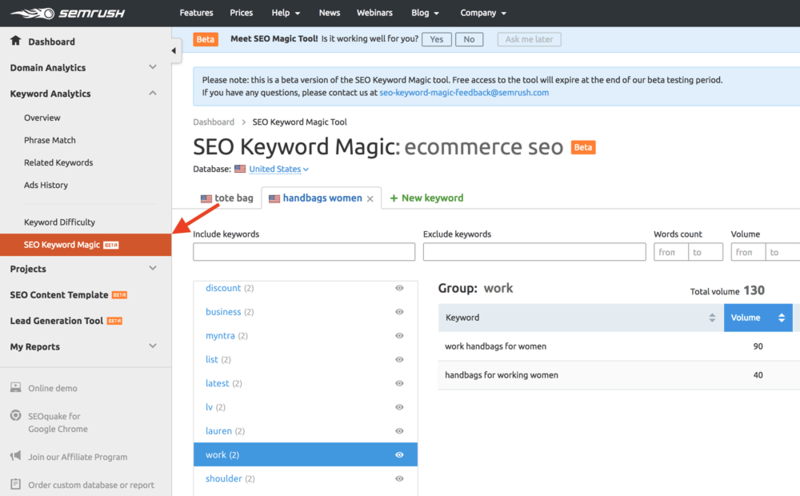 Login to SEMRUSH and select “SEO KEYWORD MAGIC” from the left menu (under Keyword Analytics). You can now start your search by typing the keywords we have found from Amazon and Google. 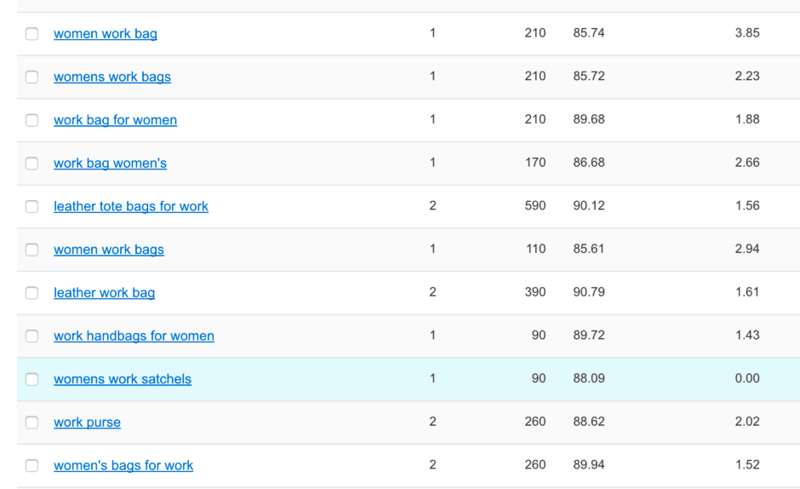 Our goal at this point is to find out the search volume for each keyword and other related keywords. Once you add a keyword, semrush will group relevant keywords together (left part). You can also narrow your search by using the filters in the top bar. This is very useful when you want to find long tail keywords that have a certain search volume. 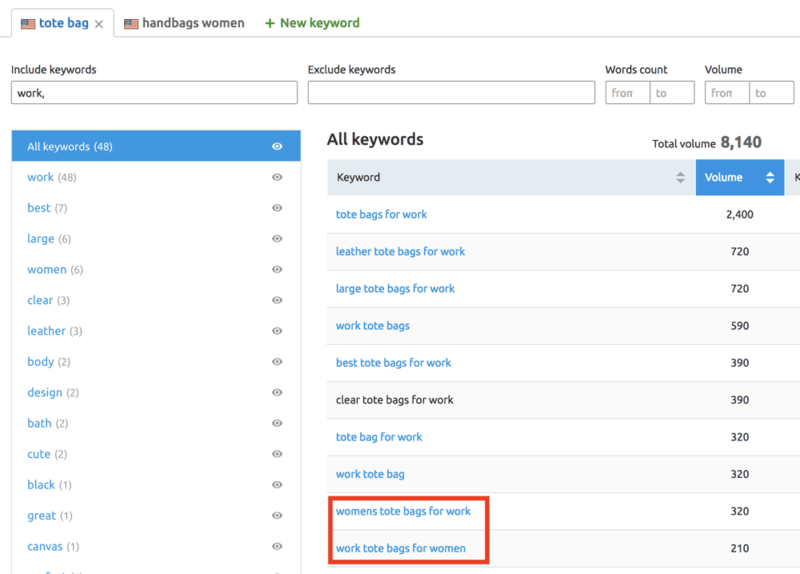 As you can see above, when you search for your main keyword (‘handbags women’), and then filter by ‘Work’, you can see the associated long tail keywords. 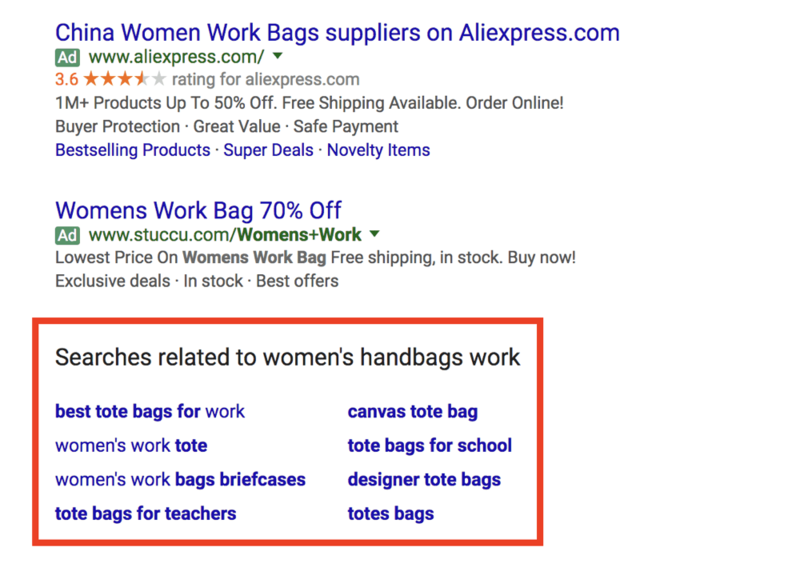 What is more interesting is that by analyzing the keywords suggested by Google, you will see that ‘womens tote bags for work’ is a better term than ‘work handbags for women’, since it has more search volume and consists of more keywords. In general, long tail keywords with 4-5 words easier to target than shorter long tail keywords. If you scroll down the list, you can find more keywords you can use for your product pages. If you combine these keywords with the brand name and model (remember the example of Amazon titles), you will end up with perfectly optimized titles for your product pages. I know that not all people have a subscription to a keyword tool. Good tools are not free and this keeps people away. The truth is, if you want to succeed in ecommerce, you will need one. Besides the keyword research, you can use it for spying on your competitors and improving your SEO and content. Nevertheless, there is a free option to use and this is no other than the Google Keyword Tool. What you should know about the Google keyword tool is that although it is free, if you don’t have an active campaign running, it will show you ranges of search volumes and not the exact estimates. So, to make any good use of the Google keyword tool, it is best to setup an Adwords campaign first (even if it is for a few dollars per day), and then do your keyword research. When using the Google Keyword Tool, we are looking for the same things as before i.e. Ideas for our category pages (The Ad group ideas tab is a good feature to use for this purpose) and long tail keywords with a commercial intent. Hint: Make sure to use the keyword filters on the left menu, to narrow down your search based on Competition and possibly average monthly searches. 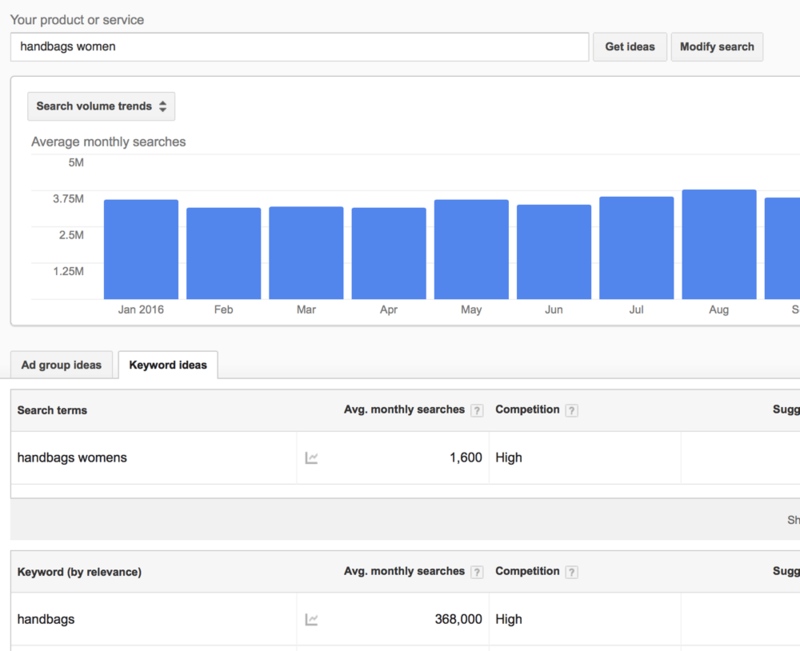 Another way to find out which keywords work for your niche is to steal your competitor’s keywords. 2nd -> Look for websites that are selling the same products as yours. Avoid big websites (like Amazon) but concentrate on websites that are similar to your ecommerce store (both in terms of size and products). 3rd-> Either take the domain or the specific product page and go to semrush, and select URL under Domain Analytics – > Organic search. This can be very useful in your process because you can see for which keywords a competitor’s page is ranking. If you want to increase your chances of ranking for the same keywords, you need to find a way to naturally mention those keywords in the body of the page. As a final step in your keyword research process, you can use Wikipedia. Wikipedia has detailed articles for almost any topic you can think off and the nice thing about their articles is that they organize the information in a structural way. You can use Wikipedia articles to find related keywords for your term (this can prove very useful later when you will write the actual titles for your homepage, product categories and product pages), and also to get a good idea on how you can organize your shop’s structure. 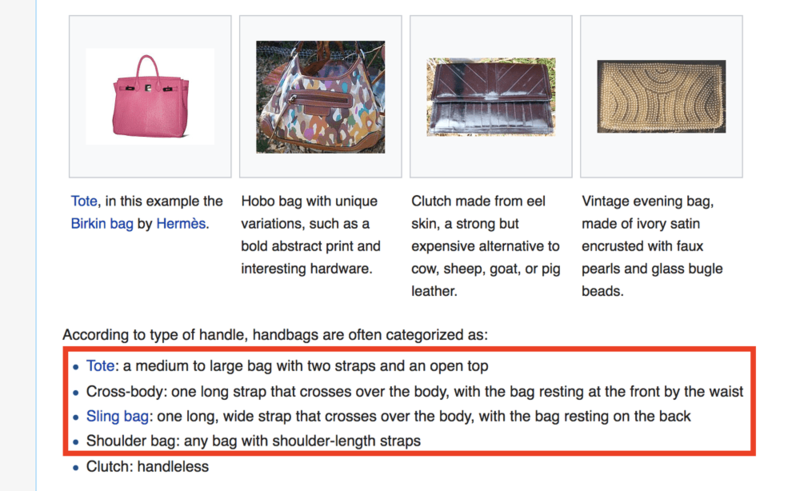 As you can see in the screenshot above, the categories suggested by Wikipedia for handbags are similar to those you can find on Google, Amazon and the Google keyword Tool. Besides doing keyword research for your online shop, you also need to do some research for your ecommerce blog. Pro Hint: If you don’t have a blog yet, our Beginner’s Guide to WordPress Blogging has all the information you need to start a blog for your ecommerce business. Now, while looking for long tail keywords for your products and category pages, you will also come across some keywords which are perfect for blog posts. include keywords like ‘how’ – people like to read articles on how to do things. exclude keywords like ‘make’ – unless you can show them how to make a bag, exclude this from your keywords. set the number of keywords between 6 and 8 – we really need to see long tail keywords so go for this range. As you can see below, there are many good candidates for blog post titles like ‘how to clean a tote bag’. Keyword research for an ecommerce website is slightly different from normal keyword research. To find out the actual keywords that customers are using to search for specific products. To differentiate between head keywords, long tail keywords and keywords with a commercial intent. To find out the search volume of those keywords. To find related keywords and terms you can use for your ecommerce blog. To find out as much as you can about your niche. Since during the process you will visit your competitor’s websites, make sure that you don’t just look at the keywords, but take note of other things like number of overall products, website features, marketing techniques they use etc. Once you are done with this step and you feel confident that you have a clear picture of the keywords related to your products, you can proceed with the next steps. These involve optimizing your shop’s structure, optimizing your product titles and category pages and start working on conversion optimization. Can you please tell me the tools, From where we can come to know about from which keywords we are getting traffic to the website. This will be the great help for all of us. You can use the ‘Search Analytics’ report in your Google Search Console or SEMRush. 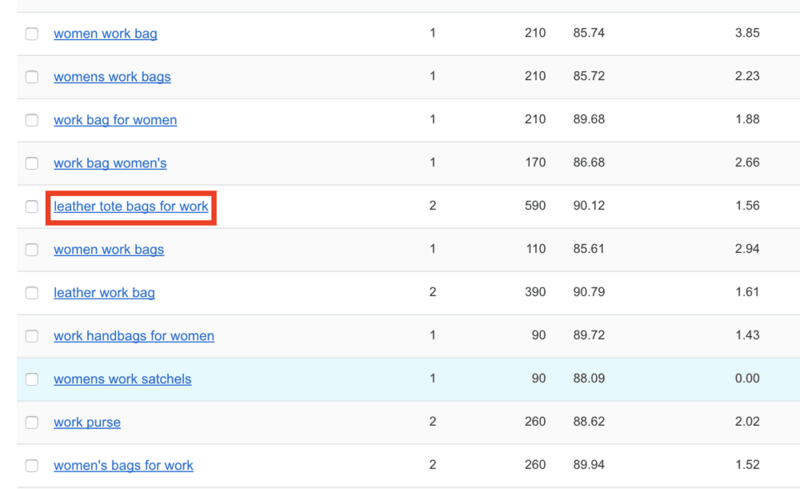 When you type a domain in semrush (or the tool you are using for keyword research), it will give you a report that shows your ranking positions for various keywords. You can connect semrush with Google Search Console to find out for which keywords you get traffic. Thanks for the reply, Sure I will check it and let you know. Step: 5: Steal Your Competitor’s Keywords, don’t you think the chances of ranking higher becomes less when we target competitors keywords, because they already have made their presence felt with those keywords to search engines? Or is their something I missed you are trying to address? You do have a point but consider this: when you rank for a keyword(s), you don’t hold your rankings for ever. If someone else comes up with a better page (better content + links), it will take over your positions. The same is true for your competitors. Having a clear picture on what works of a competitor, can do more good than harm. Thanks for making it clear why we need to do a research on our competitor keywords especially when our competitor is ahead of us in the market for a couple of years. Thanks again for this wonderful piece of work. Keyword research is one of the main factors for blogger. Your article helps to know the technique to choose keywords for my blog. One of the best article I have read on keyword research. Keyword research is one of the main factors for ranking factor of any article. Again I have learn better way to do keyword research. I have followed your techniques and found some idea about the keyword but again i have a query. How to decide to choose the keyword if the keyword has low volume but high search results. For example. a keyword ‘cheap vape juice’. Is it good practice to group two keywords means one which has high volume and high search result and one which has low volume and moderate search results.